PEC Honors Stewards of Creation! Presbyterians for Earth Care (PEC) presented the PEC Restoring Creation Award to First Presbyterian Church, Palo Alto, CA and the PEC William Gibson Lifetime Achievement Award to Lynn Cameron at our Luncheon on June 17 at Fort Street Presbyterian Church. The Lifetime Achievement Award is named for Bill Gibson who shaped the Restoring Creation for Ecology and Justice policy that was adopted by the Presbyterian denomination in 1990. Divestment from fossil fuels was a major issue at the 2014 General Assembly and the group who started it all was recognized for their work. 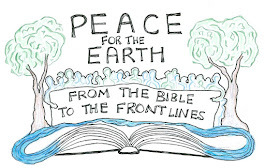 Presbyterians for Earth Care honored First Presbyterian Church, Palo Alto, CA for writing and moving a fossil fuel divestment overture to the 221st General Assembly. PEC also honored Lynn Cameron, former pastoral leader of the Earth Care House Church in the Shenandoah Presbytery, Virginia, for her early work to reduce the use of fossil fuels. Lynn Cameron has worked tirelessly since the late 1990’s to advance environmental concerns at the local, state and national levels. In 2002, she presented an overture adopted by the General Assembly that called for retirement of all outdated coal-fired power plants in the U.S. She has also advocated for local and statewide issues for cleaner air and water and land protection in the Shenandoah Valley that involve hydro-fracking and other industrial development. At her church, Trinity Presbyterian in Harrisonburg, Virginia, she led efforts to make energy saving upgrades to the facilities that included involving the youth in weather sealing. Lynn serves as an inspiration to all at Trinity Presbyterian and those who know her elsewhere. We give you thanks for the work of all of those that care for Creation and work for justice. We are especially thankful this year for the Cool Planet Working Group at First Presbyterian Church Palo Alto and for Lynn Cameron. Please instill in all of us a fervor for continued stewardship.